The Pentair 3-way valve allows you to simply change the flow of your greywater; to the greywater system OR to the sewer system. The 3-way valve can be automated or mechanized by mounting a Goldline actuator on top of the valve to allow remote switching of the greywater system. 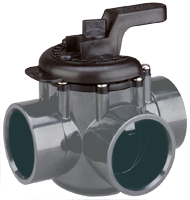 The 3-way valve accepts both 2" or 1.5" drain pipe and the 3-way valve can be plumbed with any port as the inlet. To change the port on a Pentair valve remove the two pins and reposition using the labels "right 90" or "left 90" as a guide. This valve is essential for diverting graywater to the sewer when it is not necessary to irrigate with graywater (during rainy months) or if want to shut the system off to perform maintenance. Also, if you are using cleaning products or bathing salts which are not suitable for landscape, simply switch the 3-way valve and divert the greywater to the sewer.